In small bowl, mix refried beans and 2 tablespoons taco seasoning mix. Spread about 3 tablespoons mixture in bottom of each of ten 4-oz or 6-oz mason jars. Mix sour cream and green chiles; divide evenly among cups (about 2 tablespoons per cup). 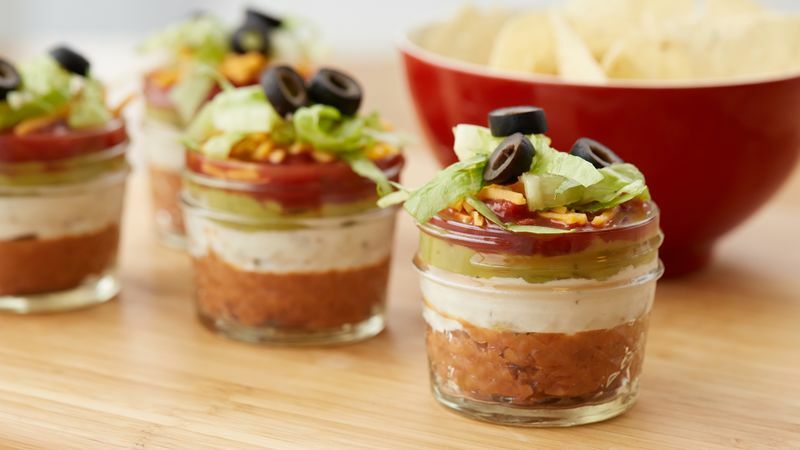 Top each with about 2 tablespoons each guacamole and salsa, slightly less than 1 tablespoon each cheese and lettuce, and a few olive slices. You can also use ten 4- to 6-oz custard cups, 6-oz or 9-oz clear plastic cups in place of the mason jars.